Geneva | 15 February 2016 – Today is International Childhood Cancer Day – a day launched by Childhood Cancer International (CCI) 15 years ago in which the strength, courage and resiliency of children with cancer and their families are celebrated. The International Society of Paediatric Oncology (SIOP) with over 1000 members joins CCI, a network of 181 grassroots and national networks of parent organizations, survivor associations and childhood cancer support institutions in 90 countries, spanning 5 continents, in the effort to raise global awareness and support for childhood cancer treatment internationally. Cancer is a serious non-communicable disease affecting more than 14 million individuals and families across the world and more than 50% will die. Although children and adolescents represent only about 1% of people with cancer, survival rates in high-income countries reach close to 80%. Adults who have survived childhood cancer represent a significant workforce and contributors to their communities and societies and there are many survivors! It is estimated that 1 in every 640 young adults under 40 in the US is a childhood cancer survivor. However, there are great disparities in outcomes for pediatric cancer patients around the world since approximately 80% of children and adolescents with cancer live in countries with limited resources and few health care professionals. Childhood cancer survival in these countries, including Africa, Asia and Latin America, is challenging since the limited number of children and adolescents who do arrive at a tertiary care hospital generally have a cancer that is too advanced to be cured and the hospitals lack human and material resources. 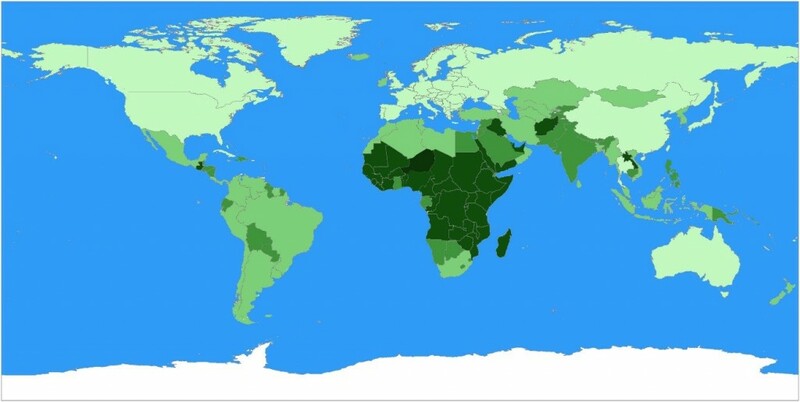 Here is a map showing the countries by the number of children under 15 years of age from 10-20% (lightest green) to 50% (Niger, darkest green). It is clear that where the need is greatest for childhood cancer, resources there are oftentimes the most limited. The International Society of Paediatric Oncology (SIOP) includes physicians, surgeons, nurses, psychologists and radiation therapists. It is the only international organization devoted to improving and optimizing childhood cancer treatments throughout the world. To that end, the SIOP Pediatric Oncology in Developing Countries (PODC) Committee with 191 members and growing was established to support colleagues in countries with nascent pediatric oncology programs in low- and middle-income countries. PODC experts from around the world work together to adapt treatment protocols to address local realities, while maintaining high scientific standards of data collection and monitoring. SIOP, CCI and PODC members advocate for improved global access to essential medicines and call for governments and the public to demand that research be performed to discover new drugs for treating childhood cancer since there have only been 2 new drugs developed in the last 20 years. There is also a need for development of more targeted and less toxic drugs as research has shown that more than 2/3 of childhood cancer survivors suffer from late effects. In a recent collaboration between the World Health Organization (WHO), SIOP and CCI under the leadership of Dr Oleg Chestnov, WHO Assistant Director General for Non-communicable Diseases and Mental Health, strengthened the reach and scope of global advocacy on childhood cancer through a high-impact side event at the World Health Assembly in Geneva. As a result, the WHO has now convened a Steering Committee with SIOP and CCI to map out a platform of action for childhood cancer. Continuing the work of WHO, SIOP and CCI, a workshop, “Childhood Cancer: Improving Access to Care” was held on January 27 2016 in Accra, Ghana to raise awareness of childhood cancer challenges in the country. Attendees included important stakeholders in childhood cancer including members of the Ministry of Health, parents of children with cancer, local WHO representatives and health care professionals. Strides were made in efforts to identify initiatives that will improve access to essential medicines, expand data collection, increase medical financial support for families with limited resources and implement childhood cancer strategies in the Ministry of Health’s Cancer Control Plan. There are similar Cross Sectoral Stakeholder dialogues planned in 2016 to raise awareness and discuss strategic issues of national childhood cancer in Ethiopia, Kazakhstan, Fiji, and Myanmar. It is intended that by bringing together key stakeholders in each country, initiatives for improving children and adolescents’ access to cancer treatment will be significantly improved. On International Childhood Cancer Day, we call on everyone around the world to advocate that their governments work together with civil society organizations and childhood cancer focused organizations to integrate and prioritize childhood cancer in their national cancer control plans, social health insurance and health and development agenda. We also urge everyone to remind political and health leaders that access to affordable childhood cancer care is part of their commitment to the Sustainable Development Global Goal 3 to Ensure healthy lives and promote well-being for all at all ages. Children and adolescents with cancer represent their countries’ future. We must ensure that no matter where these children and adolescents live, they have a chance to access affordable and appropriate cancer care and treatment, achieve a cure and have a long and productive life.